This isn’t exactly Big Mac’s Mondays. We are still on vacation in Santa Cruz (Aptos, actually), but decided to go to the local liquor store to keep up our schedule. It’s a working vacation. Deer Park Wine & Spirits is the local liquor store, but it is actually a little fancier than Big Mac’s. Unlike Big Mac’s, you cannot buy Wonder Bread, Folger’s in a can, Cheez-Whiz or Bubbleicious; although you can rent or buy a boogie board. And the Louis Jadot Pouilly Fuissé costs $5 more. As for wine, We went for a Sauvignon Blanc. 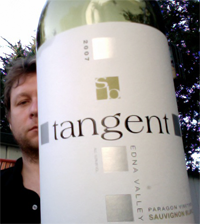 The wine reviewed is actually the 2nd SB we had today (or, actually, His 3rd…wink wink). The first (second) SB was at Seascape Resort, but only after We tended to a tween boy who had just fallen from a bike and had apparently broken his wrist. We sat with him and told him funny stories while We waited for his mom to arrive and take him to the hospital. He was cute. Really cute. He said “Oh no, this is my writing arm.” We told stories about our own broken bones and to each story he replied with sympathy, “Oh, I’m so sorry.” And then he asked for Vicodin. Anonymous, newly pubescent boy, whomever you are: get well soon. For our kindness the resort gave Us each a glass of Oyster Bay Sauvignon Blanc. Crisp, bracing, refreshing. On the way back, We stopped at Deer Park Wine & Spirits to continue that taste profile. Our reviews of what We bought are below. As usual, We didn’t do any background research on picking out the wine…We just bought what we were in the mood for that wasn’t too pricey. Later We did a little internet snooping and provide a few facts about the winery after our reviews. She Said: Pale, yellow-green color; very bright and clear. On the nose: no hint of wood but smell grass, gooseberry, wet stones, and flint. The acid of the wine is apparent just in its smell: sharp and strong. The mouth is richer than I anticipated. There is a mild creaminess, but overall it is very characteristic (or what I think as being characteristic): bracing acid, unripe pear, gooseberry, grass, lychee. No petrol. Has a New World profile. A really good value at $11.99. Seems perfectly suited for fish, etc., goat cheese, avoid cream or heavy butter. Had a second taste (or fourth or fifth) and sensed green apple, riper fruit flavors, pineapple, stone, mineral, asparagus, green bean–seems more fresh green veg than fruit. Keep thinking about it. And this means I like it… a lot. He Said: Very clear-watery, gold-green color. On the nose it is very grassy with light citrus and some new carpet (edit: she says that is a chemical thing I am smelling and I also crossed out floral. In the mouth there are strong flavors of pineapple and gooseberry, It’s clear, crisp and tangy with very nice acidity, which all last for a nice minute in the aftertaste. All in all, a terrific SB for the price. If I was rating on pure value it would be a 4/5. I don’t think of this as a typical SB, I may not have guessed it instantly.